If you are flying in Madrid, it's likely that the first place you will land in, after the airport, will be Atocha Railway Station. The original part of this first and largest railway station in Spain has been converted into a concourse with shops and cafes as well as a tropical botanical garden with 260 different species of plants, goldfish, turtles chilling in the pool and some palm trees nearly reaching the massive steel and glass roof. First we made our way to Plaza Mayor - one of those nice looking squares with a bronze statue of a horse mounted king in the middle of it, characteristic to most European capitals, in this case King Phillip III. It's a neat setting but do avoid the overpriced restaurants around it. We made a poor choice and paid the price, see for more food and drinks tips here. Catedral de la Almudena (Almudena Cathedral) is free entry so definitely worth a peek. It’s quite a modern looking cathedral with neo gothic interior and beautifully colourful ceilings. 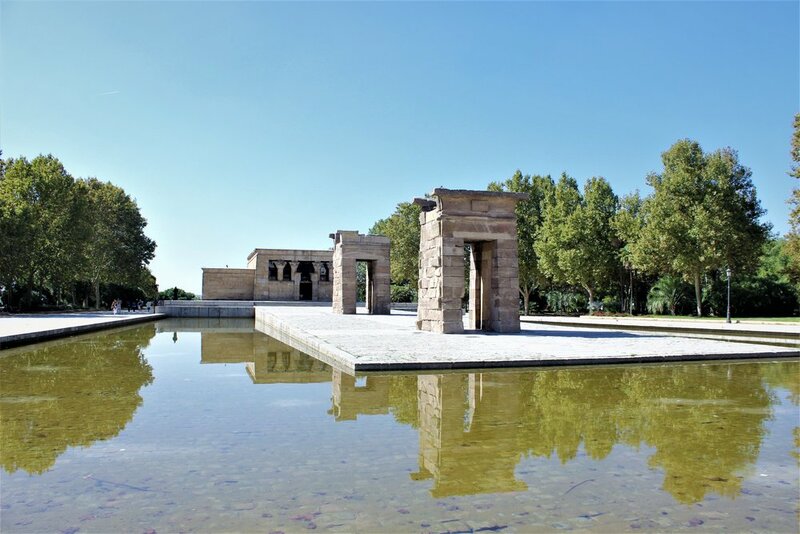 The site on which it stands was originally the location of Madrid's first mosque. Behind the cathedral, on Calle Mayor, historically the main street of Madrid, you can see the remains of the 9th century Moorish settlement and old medieval city walls parts of which date back from 12th/13th century. Next up we headed for the most famous and busiest hangout squares in Madrid - Puerta Del Sol. This is where you will find ‘Km 0’ slab, the crowd of tourists suspiciously taking pictures of the ground makes it easy to locate, which marks the starting point to Spain’s 6 national roads. You will also spot El Oso y El Madroño - statue of Madrid’s symbol – a bear and a berry tree, origins of which are unclear, I guess there used to be lots of bears in the area and this is also where madrileños eat their 12 grapes as the clock of Puerta Del Sol strikes midnight and welcomes each New Year. Definitely the place to be as there are lots of nice bars, cafes and shops concentrated around this area. If you feel like getting away from the crowds, Buen Retiro is a vast and lovely public park for a stroll in the city. Here you can see the spectacular glass and steel Palacio de Cristal that historically was built as a greenhouse to showcase flora brought in from Spanish colonies but now is used for exhibitions, and The Statue of Fallen Angel (Ángel Caído) frozen in the moment he is cast out of Heaven, as inspired by a passage in John Milton’s Paradise Lost, which is also world’s only prominent public statue depicting the Devil. Looking oddly out of place in the middle of Madrid, Templo De Debod is an ancient Egyptian monument dating back to 2nd century BC which Egyptian government presented to Spain in 1968 as a gesture of thanks to Spanish archaeologists that were working to save historic monuments that would otherwise be destroyed due to flooding after building the Aswan High Dam. For conservation reasons they only allow a limited number of people inside at the same time and we stumbled on it during the siesta time so we only got to admire it from the outside. 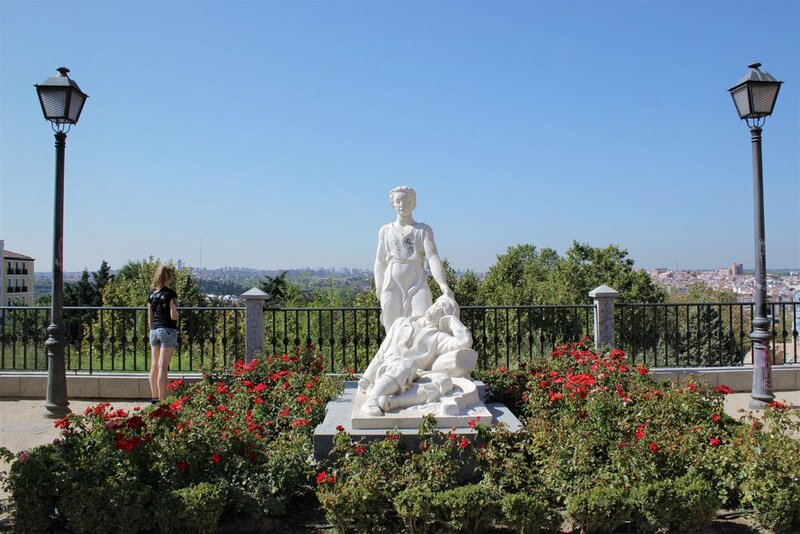 The nearby Plaza de España is a square to stop by for a bite and take in the beautiful surroundings and features a monument dedicated to Miguel de Cervantes overlooking the characters from Don Quixote. If you are in this part of town, you will probably end up on Gran Vía, the famous bustling commercial street with no shortage of entertainment - bars, cinemas, theatres, the Spanish department store El Corte Inglés and there are plenty of options for label or - in our case - window shopping. To visit Museo Nacional Centro de Arte Reina Sofía you usually have to part with 8 euros for the entry but to get in for free, go between 7pm and 9pm (Mon & Wed-Sat during these hours, only available on the spot). There will be a queue but it moves quite swiftly. If you’ve got some love and appreciation for modern art, you don’t want to miss works of Spain’s 20th century greats Dali and Picasso, especially his masterpiece Guernica, among other local and international artists. It’s so impressive to see in real life. Sadly we had to leave Prado Museum for next time we visit Madrid, but you can also get in for free Mon-Sun 6-8pm. Instead we made our way to La Tabacalera – a street art and culture hub housed in a defunct tobacco factory, hence the name. We stumbled upon a photography exhibition by Juan Manuel Castro Prieto. His work is captivating in its unpretentious nature with depicions of people and places in ambiguous territory. The whole neighbourhood of Lavapiés around La Tabacalera is one of Madrid’s most culturally diverse and surrounded by colourful street art and unassuming charm. Art in this city stretches way beyond confined spaces of museums and you will find a lot of it concentrated in this area.